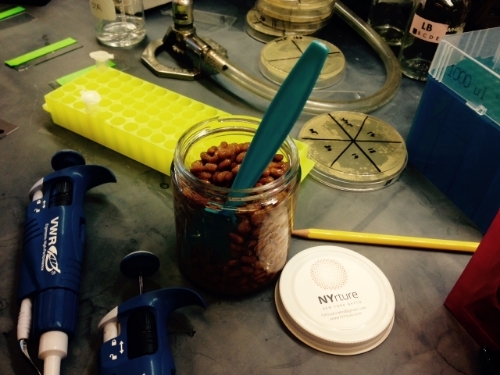 Gaga for Goo: How probiotic is NYrture New York Natto? As you see here, after fermentation NYrture New York Natto is held together by an impressive matrix of "neba-neba" (in Japanese), "goo" (in American) or "biofilm" (in scientific terms). This "goo" which gives natto such a unique and unfamiliar (to the Western palate) texture is highly prized and regarded as an indicator of natto quality in Japan. This stickiness is a substance secreted by the probiotic Bacillus subtilis during natto fermentation which help to protect them from environmental stress and connects them together, allowing communication and physical contact through a common medium. This "goo", primarily a polymer of glutamatic acid (a natural protein amino acid) (1), helps the bacteria to form a stable community as an continuous layer of cells known as a "biofilm"(2). We wanted to find out "how probiotic is our natto?" or, in other words, "how many live bacteria" were really in there in this "goo"? So, we took our natto to labs at Harvard Medical School and got to do some real science looking at our food with some of the best tools and help available! which could also be answered quite simply by streaking out a sample of NYrture New York Natto "goo" on a sterile (LB) agar petri plate to see what, if anything, would grow…answer: LOTS! Indeed, after two days at ambient temperature, robust growth of happy Bacillus subtilis originating from our natto! Microscopy has always been my favorite scientific tool. We were so lucky to have the aid and goodwill of Bacillus subtilis scientists Paula Montero-Llopis, Alex Meeske and David Rudner at HMS Microbiology to expertly help us with imaging our "goo". We learned many interesting things…. First and foremost, NYrture New York Natto is absolutely teeming with happy, living, dividing and sporulation Bacillus subtilis---even a full month after fermentation/production! Phase image of "goo" diluted/rinsed in PBS, spotted onto agar pads & viewed on inverted epifluorescence scope. Live cells are dark with bright halos, surrounded by large amounts of fainter, fragmented bacterial cell debris. Fluorescence imaging of DAPI staining of DNA (not shown here) confirms live/dead cells. Rough approximation: 15 million live probiotic bacterial cells per milliliter are present in NYrture NY Natto after four weeks in the fridge (3)! A typical "serving" might be 50-100 times this volume. The numbers are huge, and undoubtedly would be much higher still in a fresher sample. Much more on this and other exciting findings from our lab experimentations to come…. For now, many heartfelt thanks to our friends at Harvard Medical School, especially those in David Rudner and George Church's laboratories for their curiosity, assistance and enthusiasm to help take natto inquiry to a new level. Stay tuned for more early results from Harvard and continuing studies at Columbia University! References: (1) Bhat, A.R. et al. (2013) Bacillus subtilis natto: a non-toxic source of poly-gamma-glutamic acid that could be used as a cryoprotectant for probiotic bacteria. AMB Express. 3:36. http://link.springer.com/article/10.1186%2F2191-0855-3-36(2) Wikipedia [biofilm]: https://en.wikipedia.org/wiki/Biofilm (3) personal communication, Alex Meeske, Harvard Medical School.